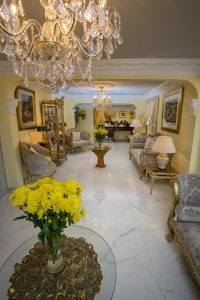 Our fabulous luxury reception room has just opened. 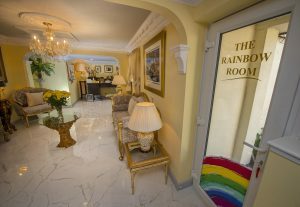 The Rainbow Room is themed to provide a serene, relaxing environment where pet owners can talk about their loss and explain their personal requirements for their beloved pet. 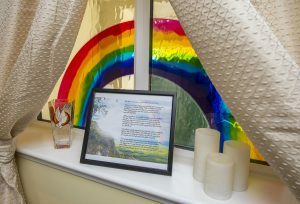 Owner Rita Harbury-Carlisle said: “The Rainbow Bridge poem suggests that when an animal dies that has been especially close to someone here, that pet goes over Rainbow Bridge. There are meadows and hills for all of our special friends so they can run and play together. There is plenty of food, water and sunshine, and our friends are warm and comfortable. Our aim is to follow this sentiment and give comfort to the owners at this difficult time”. The new room is much larger than previous spaces at the crematorium. Rita said: “We get family groups and people like friends to accompany them. This room can cater for larger numbers without people feeling uncomfortable. It is a lovely area and people can wait here while the pet is prepared for a final viewing. We really try to give everyone the individual service they require. We try to talk through all the options and it gives everyone a relaxing environment to make decisions about the type of casket required, music for the service and other important personal details”. The Nottingham Pet Crematorium has been serving the community for 25 years. Pet lover Rita and her husband John are assisted by manager Simon. They have a fleet of vehicles including a traditional hearse. Rita said: “We understand this is a difficult time for the pet owners. We want to treat their family friend with upmost respect and give them the send of their owner wishes. Every pet deserves a dignified send off, all pets are very much a member of the family”. The Rainbow Bridge Poem below, was written by an unknown author.